While the RBA has warned of the risks of leveraging into the housing market on national television, they, and other analysts, have also presented a stable picture of the housing market, by estimating a house price to household income ratio of about 4x, and accompanying such analysis with statements like the ratio of housing prices to income has been reasonably flat for a number of years. The other thing I’ll say is that it’s quite often quoted very high ratios of price to income for Australia, but if you get the broadest measures, a country-wide price and a country-wide measure of income, the ratio it about 4 ½ and it hasn’t moved much either way for 10 years. I think I can safely say that most of Australia would disagree with this assessment of stability in the housing market or support from economic 'fundamentals'. Indeed even the RBA's own representations seem a little schizophrenic on the subject, with a recent report noting that the price-to-income ratio actually increased by 50% between 2001 and 2004. Dwelling price growth significantly outpaced growth in household disposable income, with the nationwide dwelling price-to-income ratio rising from around 2½ in the mid 1990s to a little over 3 by 2001 and then to 4½ at its peak in early 2004. Which is it Glenn? Did the ratio increase by 50% in that period, or hasn't it moved much either way for ten years? One reason for the clash between public views on housing and the 'stability stance' we see out of the RBA is that the RBA grossly overestimates household incomes. I have examined the data used by the RBA and other analysts from the National Accounts (Table 14), and tried to replicate their method and reconcile the differences with ABS household survey data, which more accurately reflects household income available for current consumption. It is possible, and I have shown my results in shown in the table below. ABS household survey data shows that at the beginning of 2010, the average household income was $88,113 before tax and $74,360 after tax. This closely reconciles with my own household income estimates from the National Accounts data in 2010 (within 1.3%). Unfortunately due to the need to estimate the total number of households between census years, this method has quite a large margin for error. Given the average national dwelling price at that time was $447,994 and the median about $415,000, we are definitely in an uncomfortable range of price-to-income ratios, with 5.0x in average terms using before tax income data, and around 6.0x in after tax terms. In terms of median incomes and dwelling prices, the ratio is probably closer to 5.6x before tax, and 6.8x in after tax income (as recently estimated by fellow blogger Leith van Onselen). This happens to match the data produced by Rismark (here), after they revised their average price-to-income ratio up after noting the discrepancies in the unadjusted National Accounts data. While I don’t believe household income and house price comparisons are the best indicator of the state of the housing market (preferring comparisons of rents to incomes and yields to other rates of return in the economy), it does seem that we can use the national accounts data to give a decent regular estimate of household incomes for those who wish to use them for analysis. Maybe the RBA should try it sometime. Also important to note when comparing incomes to prices is that the debt service ratio, measured as interest payment against incomes, can be misleading. Since this measure is also published by the RBA, I assume they rely upon it in some way. 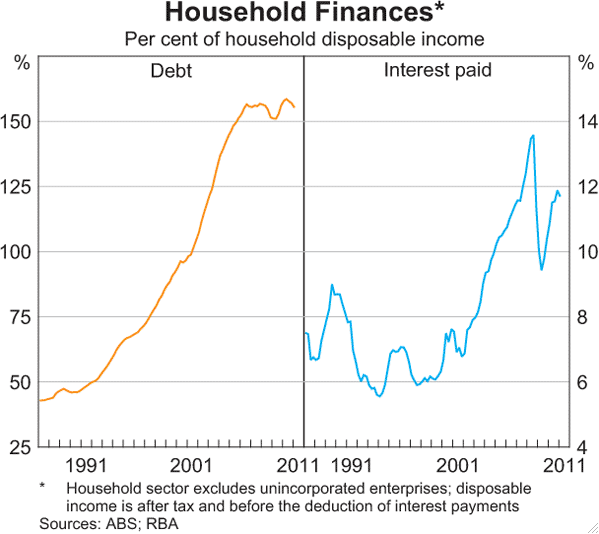 Below is the household finances graph from the RBA chart pack (available here). We can see that, following the declines in interest rates at the end of 2008, household interest payments have settled at around 12% of disposable income. Note again that the RBA disposable income measure is probably overestimated (there is no specific note about the treatment of imputed rents), meaning the both measures are probably underestimated. But in any case the trends over time still hold. What we need to consider here is that the interest paid graph shows what might be called a 'debt-service' ratio (although not in the true sense which would cover principle repayments). 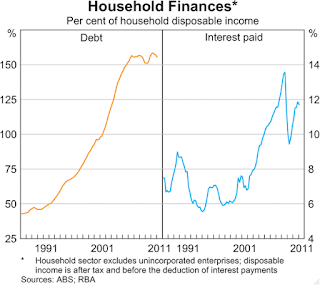 In regard to the surging household debt the RBA notes that the ...structural decline in interest rates has facilitated the increase in household debt ratios because it reduced debt-servicing costs. That is true, but would only explain an increase in debt that accompanied flat interest payments as a proportion of income, not increasing interest payments (as I have explain in detail here). What is also overlooked is that at lower interest rates the difference between the payment of just the interest on debt, and the repayment of interest and principle (to actually reduce the loan balance over a fixed period), greatly increases. For the same interest payment, a high debt balance with a low interest rate is more difficult to repay than a low debt balance with a high interest rate. The table below shows the amount of debt that a household with an income of $75,000 could service with 20% of their income ($15,000pa) at different interest rates. While a halving of interest rates means the household could double the loan amount and pay the same interest payment, the loan they could actually repay over 30 years increases by far less (as shown in the right hand column). It is also important to understand this relationship when comparing our household debt burden internationally. The RBA usually makes such comparisons without noting the importance that interest rates make to the burden of this debt on households. Given that mortgage rates vary between 7.5% in Australia to 2.5% in Switzerland and 3% in Germany and much of the EU (and noting the tax deductibility of mortgage interest in Netherlands), these differences are important. I will finish this analysis by presenting three graphs. First is a graph of the household occupancy rate. The reason to include this is that while household incomes may be still growing nicely, the number of people per dwelling has been increasing since late 2005, so in per capita terms incomes are not looking as good. The second graph shows the contributions of insurance premiums and claims to household income (which I removed in my income estimation method). When this number is positive it means that household insurance claims were more that the premiums paid in that period. That’s why we see a massive spike in February 2011 from the claims relating to floods and cyclone Yasi (and amongst other things, the Black Saturday Bushfires in early 2009 – note the data is very cyclical with a summer peak). It seems odd to have either the insurance premiums or claims in estimates of household income (although makes up just a fraction of a percent of the total). 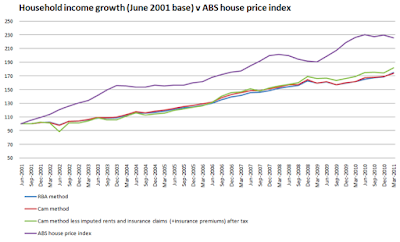 The third and final graph compares the growth in household incomes using each method with the ABS capital city price index. Of course, I have chosen an arbitrary baseline at June 2001, but I do note that mortgage interest rates then were the same then as they are now (indeed mortgage rates were about the same as now back in 1997 - see here), so the deviation observed could easily be interpreted as an overvaluation of housing. What the graph mostly tells us is that there is a pretty solid reason so many people believe that house prices are historically high and are more likely to fall than rise in the near future, being supported only be our willingness to incur debt, and not our incomes. heard on the ABC this morning that retail rents in sections of Syd and Melb are higher than the Chans de Lisse in Paris. Strange that the Dollar is worth less then the Euro and that the number paid of salary (not currency conversion) is about the same as in Australia. My wife's apartment in Finland, in a university town 5 min walk from the town center costs less to rent per month than a similar one in Armidale (a comparable city) does per week. You means the Champs Elysees? Yes, Australia has a lot of debt to unwind and all prices will fall - first assets (land and rents), then primary and secondary goods (including capital) and also wages. I have made similar international comparisons before, and mine was a run down house in Darra (Brisbane) for the price of a French chateau on 5Ha with a pool and guest house. I want my salary via the RBA method please! 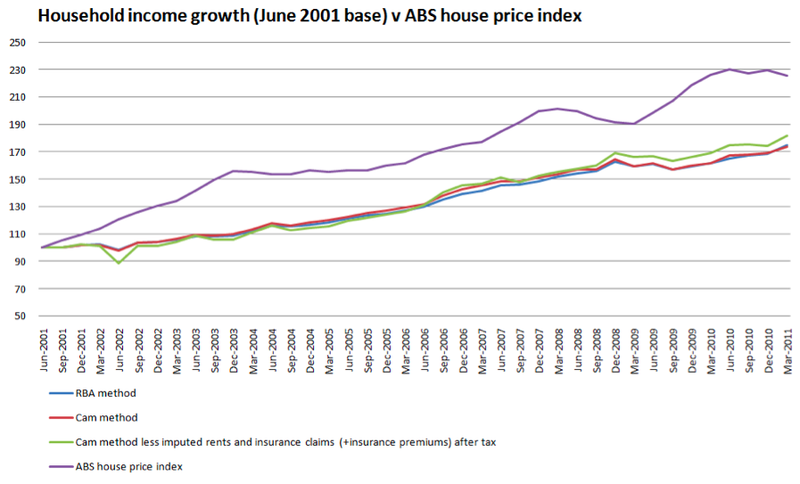 I do not understand why everyone is making such a big deal about the RBA "overstating" household incomes. The reason they use that measure in the context they do is because it's the only measure in which meaningful international comparisons can be made, given the standardisation of international economic accounting. Further, a 4x 5x or 6x ratio is largely insignificant, as long as the household sector can service that debt burden. What matters is the movement in that ratio, which has stabilised. With house prices flat (and even the most optimistic commentators are not expecting another boom), growth in household incomes will address the ratio (if it is elevated) over time. all assets will fall, plus goods and wages ?! Isn’t it a deflationary scenario? RBA should cut interest rate to ZERO! I hope it will never happen on us. I agree the income measure and ratio is not a big deal in isolation (as I said). But the measure has been misused to generate the impression of stability and a lack of risk in Australian housing. Clearly, with price falls since peak in Brisbane and Perth already greater than 10%, and monthly falls in these markets still above 1%, house price stability is not widely the experience on the ground. If the ratio was so stable and a fundamental support for prices, why have price fallen at all? "With house prices flat (and even the most optimistic commentators are not expecting another boom), growth in household incomes will address the ratio (if it is elevated) over time"
If these two variables (house prices and incomes) are completely independent, then yes. But I would argue they are not, and they are both driven strongly by credit growth. After all, buying an existing home is simply borrowing money to give to the previous owner. Which means that credit growth is basically like fiscal stimulus by the private sector to itself. If house prices could be flat and income growth could close the ratio, why are prices falling now? And what will stop this fall? Yes there is plenty of ammunition for rate cuts, but whether would be enough to stop house prices falling I don't know. I can't predict the future (although I often pen some words just in case I'm right), but it seems pretty clear that the downside risk in Aussie housing are far greater than any upside potential, and it would be foolish to leverage into this asset class at this point in time. am I reading this wrongly or is this statement of anon above indicating that things are about twice as bad as Cam's suggestion? RE: decent regular estimate of household incomes for those who wish to use them for analysis. Maybe the RBA should try it sometime. perhaps they have and have been told to paint a less gloomy picture?